Where do we begin? Well let’s start with the fact the STRAFE is world’s first fully integrated noise reduction mechanical gaming keyboard and without a doubt one of the best gaming keyboards currently on the market. 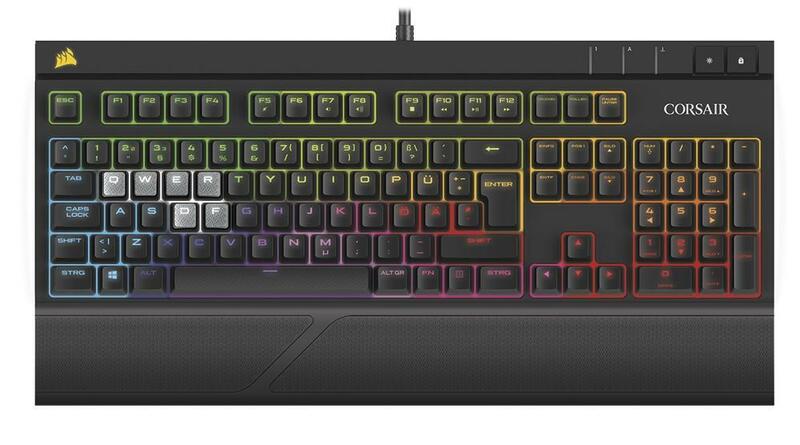 This latest keyboard from Corsair retains the excellence its predecessor the K70 RGB had but will now be quieter due to its Silent high-performance key switches making it up to 30% quieter than other mechanical gaming keyboards. In terms of the switches themselves each MX Silent switch has the same linear action, moving straight up and down without any additional tactile feedback, this combined with a 100% anti-ghosting with 104 key rollover on USB ensures that every keypress registers, no matter how fast you play. Alongside this the Corsair STRAFE RGB has the durability, styling and responsiveness that all Corsair gaming keyboards are famed for alongside a multicolour per key backlighting offering a high level of customisation. 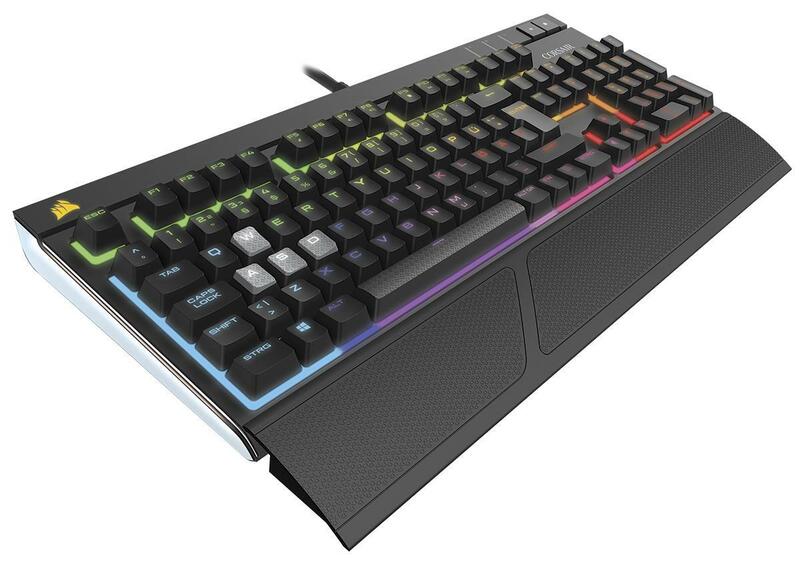 Currently in my opinion Corsair’s per-key RGB backlighting is the best of all the mechanical keyboards on market as each key is bright enough to be seen clearly at day or night, the Strafe also gains a light strip on either side of the keyboard tray which looks great. The Corsair has also been designed with style and comfort in mind with black anodised aluminium used to finish the lightweight keyboard, alongside a detachable soft-touch rest textured to provide just the right amount of grip to keep your hands in place and provide long-lasting comfort. You also get two sets of contoured, textured key caps and a key cap puller tool. One set replaces the W, A, S and D keys for FPS gaming, while the other swaps out the Q, W, E, R, D and F keys for MOBAs. The textured finish has also been applied to the space bar, helping distinguish it from the rest of the bottom row keys. Finally with its 100% MX RGB key switches for fast, precise actuation and superior feel, and each key having the ability to be individually programmed to display any of 16.8M colours it means a level of customisation never before seen in a mechanical keyboard. So game without compromise with the Corsair STRAFE RGB Silent mechanical Gaming Keyboard. Check out Box.co.uk when you’re looking to purchase any gaming equipment as they have an extensive range of gaming PC’s, laptops, keyboards, headsets, GPU cards and much more at competitive prices.